Hi, I'm Jamie. I'm here to tell you about our Water Works system. This is a stand-alone, fresh water delivery system, which features an on-demand pump connected to a 3/4" supply line that will supply fresh water to any fixtures you might have, whether it be a toilet or a sink inside of a trailer or whatnot, or a portable shower. It has a time-delay safety switch here, which protects the pump from burning up, provided there's a leak in the system or it runs out of water. It features also a 10" port here. Now, if you look inside of our tank, you'll notice we have a float valve here, and that would connect up to a line that's outside the trailer; that would keep your service operator from having to fill the tank from inside the trailer. They can fill it from outside the trailer. And if you spin around here to the front side, you'll see those connections here. Now this would be connected to your fill-valve here that you saw inside. This line would be connected to a line that you would plumb outside your trailer that would serve as an overflow. And that would also be an indicator for when your tank is filled - when you see water coming out of that supply line. The pump is operated with 110V; it pulls 1.5 amps protected by a GFCI protector plug. This tank stands at 60" tall. It's 23" in diameter and has a capacity of 93 gallons. It also has a drain on the bottom side, a 1/2" drain that you can either drain out that way, or if you wanted to you can plumb that again to the outside of your trailer to keep their water from draining inside the trailer. This unit weighs 46 lb. empty, and also will 820 lb. when filled to capacity. And if you'd like to double your capacity, you can add an extra tank to create a capacity of 186 gallons. These two tanks are connected with the plumbing parts you see here through the drain fittings. It has a T here, which you could drain through both of your tanks. Now, if you'd like any other information regarding these products or any other products that we manufacture, if you could please visit our website. And I thank you for your time. The PolyJohn Water Works delivery system supplies fresh water to portable sinks, showers, toilets, or restrooms. Find out more by watching this introductory video. 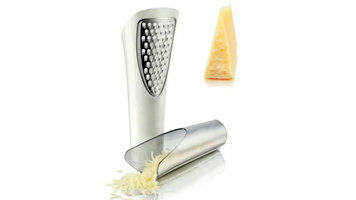 Grating cheese has never been easier with this Vacu Vin cheese grater! With a useful detachable reservoir, you’ll always have a user-friendly product that keeps your cheese in one convenient location. 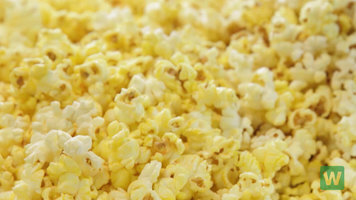 Everybody loves popcorn! This Carnival King Royalty Series popcorn popper is certain to be a hit with customers. 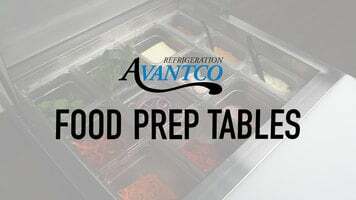 Watch this video to learn why this phenomenal machine will be a brilliant purchase for your restaurant!